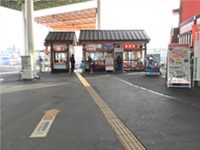 Access - Miyajima Matsudai Kisen Tourist Ship Co., Ltd.
Miyajima Matsudai Kisen Tourist Ship Co., Ltd.
Board Hiroden Miyajima Line 2 at Atomic Bomb Dome and get off at Miyajima-guchi Sta. (approx. 45 min.). Board Hiroden Miyajima Line 2 at the Hiroshima Sta. 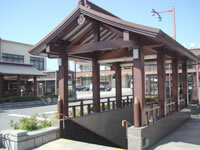 stop just in front of the south exit of JR Hiroshima Station and get off at Hiroden Miyajima-guchi Sta. (approx. 70 min.). When using the JR train, buy a ticket to Miyajima-guchi. Board the JR Sanyo Line train bound for Iwakuni at JR Hiroshima Station and get off at JR Miyajimaguchi Sta. (approx. 25 min.). For further information about the Hiroden Miyajima Line, go to the Hiroshima Electric Railway Co., Ltd. website. 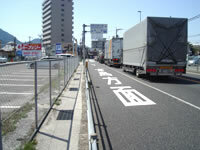 Get off the Hiroshima Iwakuni Road (expressway) at the Hatsukaichi interchange and proceed toward Iwakuni on Route 2. 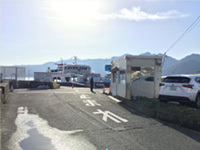 Miyajima-guchi ferry terminal is approx. 10 min. from the interchange. 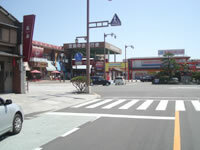 At Miyajima-guchi, use the Momiji-Honjin car park which is conveniently located close to the ferry terminal. ※A car ferry service is available. 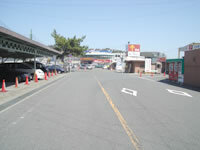 However, there is no car park on Miyajima Island. 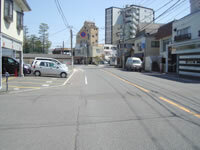 ※In and around Miyajima-guchi, there are many other car parks. 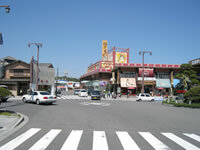 Get off the Hiroshima Iwakuni Road (expressway) at the Ono interchange and proceed toward Hiroshima on Route 2. 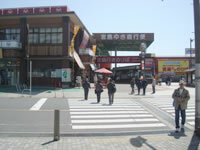 Miyajima-guchi ferry terminal is approx. 10 min. from the interchange. 1.Exit at the Hiroden Miyajima-guchi Sta. 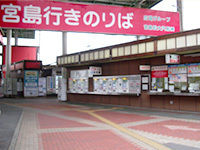 ticket gate. 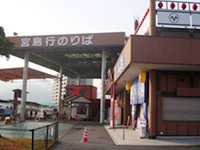 2.Proceed to the Miyajima Matsudai ferry terminal. 3.Buy your ticket at the ticket counter (or from the ticket-vending machine). 4.Board the ferry at the boarding gate. 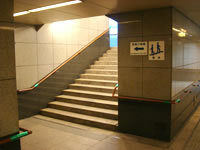 1.Exit at the JR Miyajimaguchi Sta. 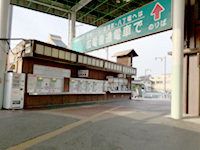 ticket gate. 2.Walk toward the sea and enter the underground walkway. 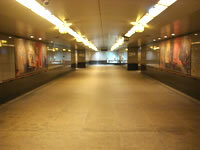 3.Walk through the underground walkway. 4.Walk up the left-side stairs heading in the direction of the Miyajima-guchi port. 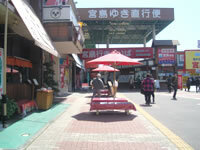 5.Follow the sidewalk to the ferry terminal. 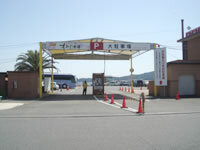 6.Proceed to the Miyajima Matsudai ferry terminal. 7.Buy your ticket at the ticket counter (or from the ticket-vending machine). 8.Board the ferry at the boarding gate. 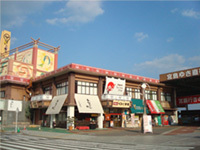 1.Take Route 2 toward Iwakuni and pass over the Miyajima Kyoteijo boat-racing stadium. 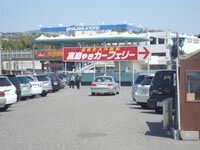 Turn left at the large “カーフェリー (Car Ferry)” signboard. 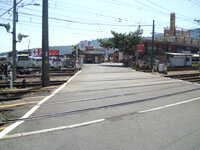 2.Go across the railroad crossing and go toward the large car park. 3.Enter the large car park (parking fee is payable). 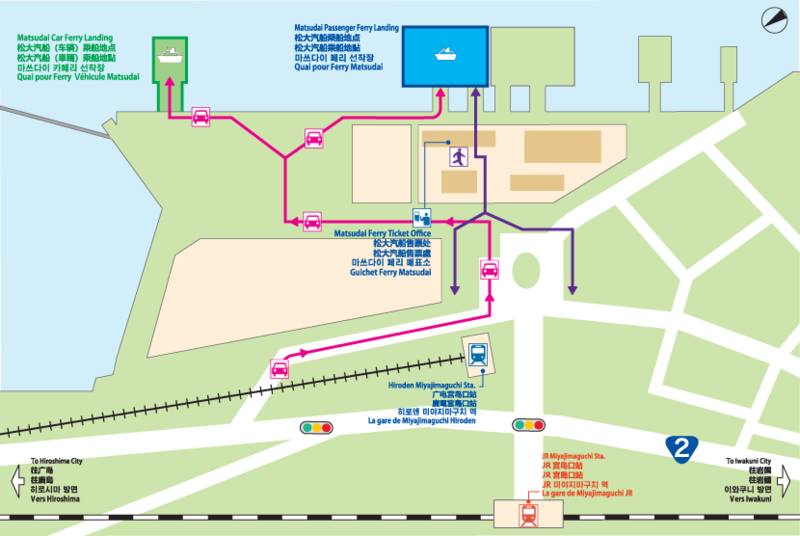 4.After parking your car, go to the Miyajima Matsudai ferry terminal through the passage next to the Momiji-Honjin building. 5.Turn right at the end of the passage. 6.Buy your ticket at the ticket counter (or from the ticket-vending machine). 7.Board the ferry at the boarding gate. 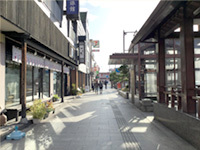 1.Take Route 2 toward Iwakuni and turn left at the "Miyajima-guchi Sta." intersection. 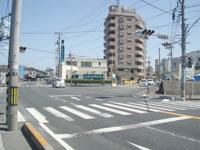 2.Turn left just before the Miyajima-guchi traffic roundabout. 3.Go toward the large car park. 4.Enter the large car park (parking fee is payable). 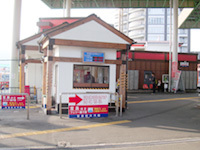 5.After parking your car, go to the Miyajima Matsudai ferry terminal through the passage next to the Momiji-Honjin building. 6.Turn right at the end of the passage. 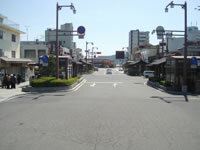 1.Take Route 2 toward the Hiroshima city and turn right at the "Sarachi Wakare" intersection. 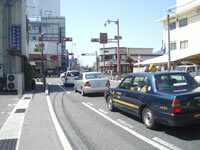 3.Go straight, and you do so, you will see the Miyajima-guchi traffic roundabout on your right. 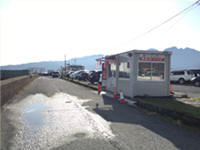 1.Follow the “宮島ゆきカーフェリー (Car ferry for Miyajima)” signboard and go through the entrance next to the large car park. 2.Buy your ticket at the ticket counter. 3.Following the instructions of the staff, board the ferry at the boarding gate. Copyright © 2010 Miyajima Matsudai Kisen Tourist Ship Co., Ltd. All rights reserved.